For those whose operatic priorities lie firmly and indeed exclusively in the realm of singing, there would have been enough here to satisfy: not necessarily something to be taken entirely for granted, given the compromised vocalism one sometimes endures. But, even assuming that one could somehow disregard one of the noisiest, most ill-behaved audiences I have had the misfortune to experience at Covent Garden, a person with even the slightest interest in opera as drama would have been sorely disappointed. It frankly beggars belief that, especially for so popular a work, Francesca Zambello’s production was not retired after a single outing, for rarely in my experience has there been such critical unanimity about any staging of any opera. Doubtless revival director Bárbara Lluch did what she could, and there were even signs in the first act that the deep-frozen corpse might occasionally be twitching in the direction of the merely comatose. Nevetheless, Zambello’s production remained as vacuous as any opera production I can recall. Its one glimmer of an idea turns out to be nothing of the sort: religious imagery remains nothing more than religious tat. And that, despite ludicrous hairstyles and the bizarre pointing hand, is it. Faced with a re-dramatisation of the Fall, pre-emption of Mephistopheles, one of the greatest scores ever written, etc., etc., there comes nothing in response. Don Giovanni, for reasons that are not entirely clear to me, seems to present almost insuperable difficulties to contemporary directors; the only two I can recall emerging with relative honour in the theatre are Graham Vick at Glyndebourne and Calixto Bieito at ENO. Yet even the most perverse concept, even the most unclear, such as that Roland Schwab recently served up for Berlin’s Deutsche Oper, would be preferable to nothing at all. Has Zambello ever read Da Ponte, let alone Mozart? If so, that only serves to render her ‘response’ the more pitiful. Her similarly ideas-free Carmen just about works on as straightforward level of response as one can muster, but this, like Giovanni himself, lies utterly beyond redemption. It would be vain to claim that the directorial context held no implications for the vocal performances, but the singers almost all emerged with considerable credit, the sole disappointment being a woolly Masetto from Matthew Rose. 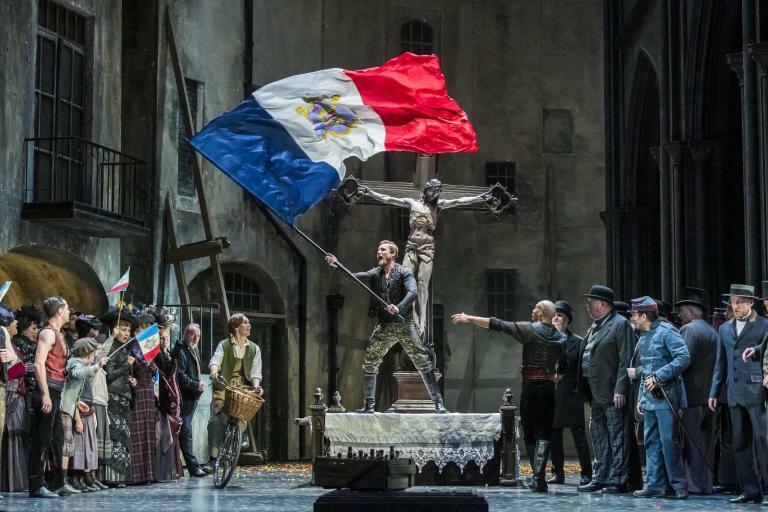 Erwin Schrott’s Giovanni was beautifully sung and as well acted as one had any right to expect, yet even the darkness of his tone at its best sounded less dangerous than it had when he took the role in the same production in 2007. He could be readily forgiven for simply having had enough, though he would doubtless have been delighted by the support of Anna Netrebko from the audience. Alex Esposito is a fine Leporello, as he managed to show even in the aforementioned Berlin staging, but here too often he was forced to play the clown: a wasted opportunity, though he nevertheless managed to shine in the Catalogue Aria. Carmela Remigio proved an intelligent Donna Anna: no mean feat in context. What she achieved vocally, with fine command of line and ever-welcome ease in her native tongue, fully vindicated the faith placed in her by no less a conductor than Claudio Abbado. Ruxandra Donose actually seemed more at ease than she had in Berlin; again she did vocally what she could. Kate Lindsey was a spirited Zerlina, if perhaps sometimes too saucy for Mozartian style (though one could hardly blame her for attempting something, indeed anything, to alleviate the directorial tedium). Bar an unfortunate and highly-exposed scooping up to the note in ‘Il mio tesoro’ – the much- and justly-maligned ‘traditional’ conflation of Vienna and Prague was employed – Pavol Breslik made an attractive-toned Don Ottavio. Reinhard Hagen, despite a truly absurd tempo forced upon him, managed to make the Commendatore’s words during the Stone Guest scene at least count for something. To begin with, I wondered whether the well-nigh uniformly negative criticism – from the first of the two casts – of Constantinos Carydis’s conducting had been unfair. The Overture was far too fast, in both sections; indeed, there was no discernible change of tempo between them. But thereafter for a while there was greater variation than I had been led to expect. If hardly Colin Davis or Daniel Barenboim, let alone Busch, Giulini, or Furtwängler, I had heard considerably worse. There was even some sensitively shaped handling of orchestral recitative, something not to be taken entirely for granted in an age with a dearth of Mozart conductors. But early relative promise dissipated, the end of the first act finale falling flatter than I have ever heard. It was not a matter of the climax running away with itself, as one might expect; there simply was no climax. The music stopped, and that was the end of that. What one might politely call eccentrically fast tempi became, if not quite the norm, than depressingly frequent in the second act, yet the effect was not hyperactive but inert. The appearance of the Stone Guest was somehow – and not just on account of the production – utterly inconsequential, Mozart’s chords skated over as if they were nothing, or worse than nothing: something out of Philip Glass, perhaps. The epilogue was as ruinously hard-driven as any Mozart performance I have encountered. Carydis’s singers and even some in the audience deserved far, far better.